Bolivian Thoughts opinion: These type of activities are our ONLY hope to enforce the Referendum that forbids evo to run for office again! He has absolute control of ALL State powers, international organizations like OAS and its IACHR, are extremely slow and have other motivations like Almagro’s intend to stay in office, thus, they are not reliable. Suffice to say that the Nicaraguan ordeal took hundreds of death citizens and seven years for the IACHR to say anything. We are alone, we must fight against evo’s delusional, illegal, illegitimate attempts to remain in power! The commemoration of the three years of the referendum of February 21, 2016, which said No to the renomination of President Evo Morales and Vice President Álvaro García Linera, opens different calls for various sectors and now seeks to unify them. The president of the Committee for Santa Cruz, Fernando Cuéllar, yesterday called for the march on Thursday 21, which will leave from the Plaza del Estudiante, at 18:00, to the plaza 24 de Septiembre. They will ask the platforms to join to show the unity of the people of Santa Cruz. 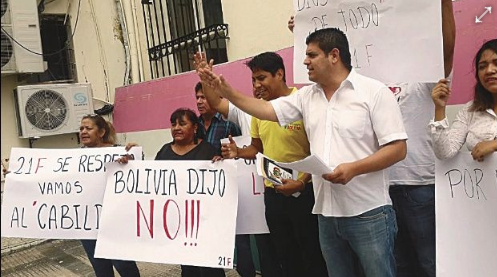 In that same line, Eduardo Gutiérrez, of SOS Bolivia, clarified that they will make a massive concentration, with the same route of the civic ones, although they still have to coordinate. “We want to avoid different concentrations,” he said. Walthy Égüez, on behalf of the Federation of Neighborhood Councils, supported the civic mobilization and compromised the participation of the neighbors. For its part, the Bolivian University Youth group; the platforms I love life, and First Bolivia; and the Movement Transforms Bolivia, convene to the open cabildo called for freedom, life and democracy, for Thursday, February 21, at 18:00, in the Christ. From this historical scenario they intend to make decisions about the actions to follow. The candidate for vice president for UCS, Humberto Peinado, was in charge of launching this call, noting that the figure of the open cabildo is covered by the Political Constitution of the State. He said that one of the measures to take may be the requirement of the resignation of the members of the Supreme Electoral Tribunal and trials of responsibilities to the members of the Constitutional Court that signed the sentence that led to the renomination. This entry was posted in Bolivia, Politics, Santa Cruz, Social Unrest and tagged corruption in public office, demagogue, democracy in peril, police and judicial corruption. Bookmark the permalink.